Spinning is really exhillarating and fun. To do a spin, start riding in smaller and smaller circles until you're actually making a full circle with each revolution of the wheel. You're riding around the edge of the tire. This can lead into a pirouette, which when you spin around on a point. It looks really cool! 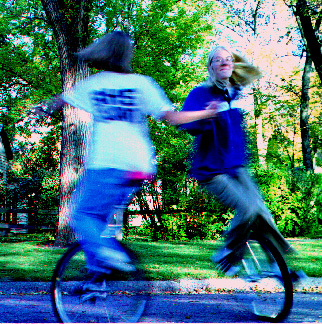 Twirling: Two unicyclists ride toward each other, grab right (or left) hands and hold onto each other as they ride in a circle together. You can get going really fast if you want. Then let go, and ride out of it. Two-person Pirouette: It's harder, but more fun. First, have one person stand in the street, holding their arm up, rigidly. The unicyclist rides up to the person, also with their arm rigid. Then, slap hands and push off against the other person to get spinning around in little circles. Then, ride out of it. It's so cool! Later, have two unicyclists ride toward each other, slap hands and spin off separately.